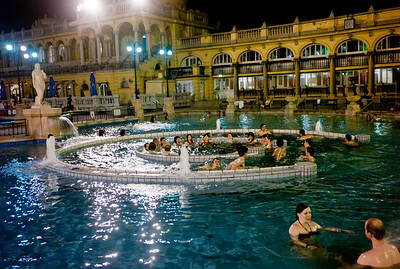 Budapest is the SPA capital of the world. 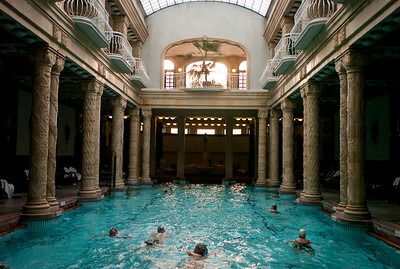 Locals and tourists come use to the public and private baths, tracing back to Roma era, to relax and rejuvenate. 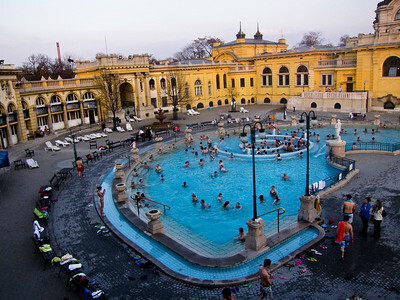 March , 2012, Budapest, Hungary - View of one of three outdoor pools in Szechenyi Bath, where locals and tourists spend as long as 10 hrs a day in the water. Budapest is known as the SPA Capital of the world. Nearly 120 hot springs feed the city's historic thermal baths (Furdo) and approximately 70 million litres of water used every day. 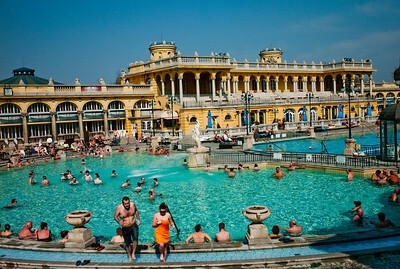 March , 2012, Budapest, Hungary - View of one of three outdoor pools (which also has whirlpool) in Szechenyi Bath. Budapest is known as the SPA Capital of the world. Nearly 120 hot springs feed the city's historic thermal baths (Furdo) and approximately 70 million litres of water used every day. 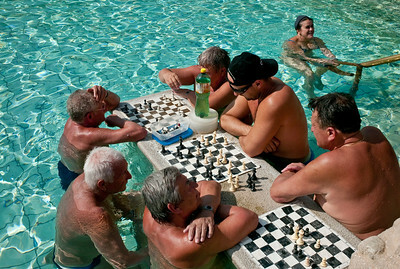 March , 2012, Budapest, Hungary - Locals play chess in the water at one of three outdoor pools in Szechenyi Bath, where locals and tourists spend as long as 10 hrs a day in the water. Budapest is known as the SPA Capital of the world. Nearly 120 hot springs feed the city's historic thermal baths (Furdo) and approximately 70 million litres of water used every day. March , 2012, Budapest, Hungary - A known rock star and a local, Endre Kiss of the band "The Hooligans" spends his morning sun bathing at Szechenyi Bath. Budapest is known as the SPA Capital of the world. Nearly 120 hot springs feed the city's historic thermal baths (Furdo) and approximately 70 million litres of water used every day. March , 2012, Budapest, Hungary - Tourists enjoy hot bath in one of three outdoor pools in Szechenyi Bath, where locals and tourists spend as long as 10 hrs a day in the water. Budapest is known as the SPA Capital of the world. Nearly 120 hot springs feed the city's historic thermal baths (Furdo) and approximately 70 million litres of water used every day. The water full of minerals is supposed to cure many illness. March , 2012, Budapest, Hungary - view of the swing pool at Szechenyi Bath, where locals and tourists spend as long as 10 hrs a day in the water. Budapest is known as the SPA Capital of the world. Nearly 120 hot springs feed the city's historic thermal baths (Furdo) and approximately 70 million litres of water used every day. The water full of minerals is supposed to cure many illness. March , 2012, Budapest, Hungary - One of the visitors takes a cold bath after the sauna at Szechenyi Bath. Budapest is known as the SPA Capital of the world. Nearly 120 hot springs feed the city's historic thermal baths (Furdo) and approximately 70 million litres of water used every day. The water full of minerals is supposed to cure many illness. 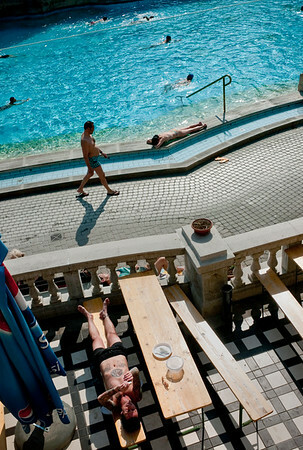 March , 2012, Budapest, Hungary - Regular local visitors take sun bath in between their swims at Szechenyi Bath and Spa. Budapest is known as the SPA Capital of the world. Nearly 120 hot springs feed the city's historic thermal baths (Furdo) and approximately 70 million litres of water used every day. March , 2012, Budapest, Hungary - Local celebrity Endre Kiss of the rock band The Hooligans, seen at Szechenyi Bath, where locals and tourists spend as long as 10 hrs a day in the water. Budapest is known as the SPA Capital of the world. Nearly 120 hot springs feed the city's historic thermal baths (Furdo) and approximately 70 million litres of water used every day. The water full of minerals is supposed to cure many illness. 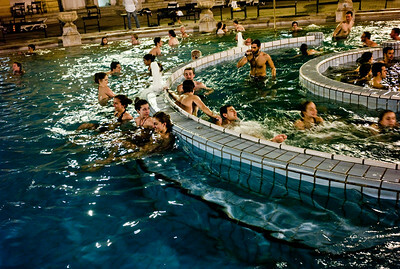 March , 2012, Budapest, Hungary - Visitors enjoy a night bath in a whrilpool at Szechenyi Bath and Spa. Budapest is known as the SPA Capital of the world. Nearly 120 hot springs feed the city's historic thermal baths (Furdo) and approximately 70 million litres of water used every day. March , 2012, Budapest, Hungary - One of the visitors at Szechenyi Bath and Spa. Budapest is known as the SPA Capital of the world. Nearly 120 hot springs feed the city's historic thermal baths (Furdo) and approximately 70 million litres of water used every day. 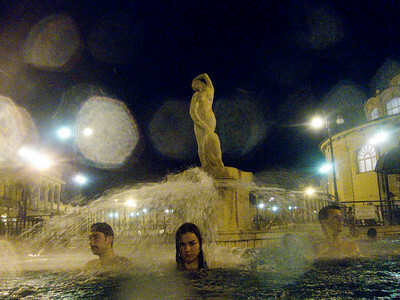 March , 2012, Budapest, Hungary - Visitors enjoy a night bath in one of the pools at Szechenyi Bath and Spa. Budapest is known as the SPA Capital of the world. Nearly 120 hot springs feed the city's historic thermal baths (Furdo) and approximately 70 million litres of water used every day. 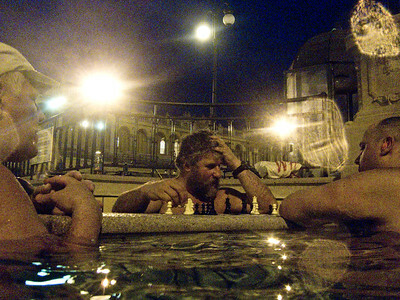 March , 2012, Budapest, Hungary - Regular local visitors enjoy evening chess at Szechenyi Bath and Spa. Budapest is known as the SPA Capital of the world. Nearly 120 hot springs feed the city's historic thermal baths (Furdo) and approximately 70 million litres of water used every day. March , 2012, Budapest, Hungary - Young woman from Germany enjoys her night batch at Rudas bath. Budapest is known as the SPA Capital of the world. Nearly 120 hot springs feed the city's historic thermal baths (Furdo) and approximately 70 million litres of water used every day. March , 2012, Budapest, Hungary - A local relaxes after the spa at Szechenyi Bath and Spa. Budapest is known as the SPA Capital of the world. Nearly 120 hot springs feed the city's historic thermal baths (Furdo) and approximately 70 million litres of water used every day. March , 2012, Budapest, Hungary - Waiting room at Sauana in Budapest, a SPA capital of the world. Budapest is known as the SPA Capital of the world. Nearly 120 hot springs feed the city's historic thermal baths (Furdo) and approximately 70 million litres of water used every day. March , 2012, Budapest, Hungary - Men only bath at Gellert Spa Budapest is known as the SPA Capital of the world. Nearly 120 hot springs feed the city's historic thermal baths (Furdo) and approximately 70 million litres of water used every day. 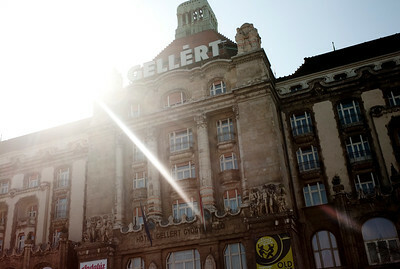 March , 2012, Budapest, Hungary - The entrance to th Gellert hotel. 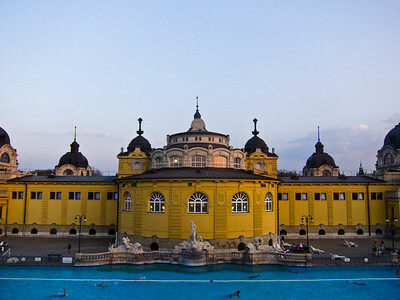 The luxurious Gellert SPA is popular among the tourists. Budapest is known as the SPA Capital of the world. Nearly 120 hot springs feed the city's historic thermal baths (Furdo) and approximately 70 million litres of water used every day. 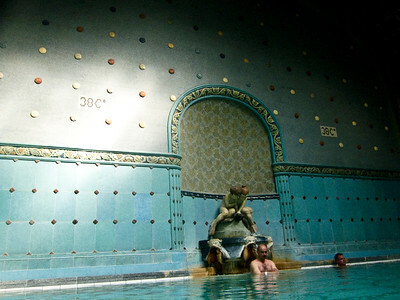 March , 2012, Budapest, Hungary - One of the oldest thermal baths at Gellert Hotel and SPA. The SPA has separate baths for men and women during the week and open to all on Sundays. Budapest is known as the SPA Capital of the world. Nearly 120 hot springs feed the city's historic thermal baths (Furdo) and approximately 70 million litres of water used every day. March , 2012, Budapest, Hungary - Swimming pool with two storey high columns at the Gellert hotel and SPA. Budapest is known as the SPA Capital of the world. Nearly 120 hot springs feed the city's historic thermal baths (Furdo) and approximately 70 million litres of water used every day. 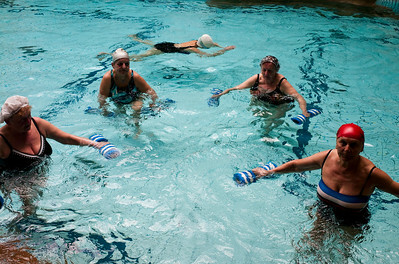 March , 2012, Budapest, Hungary - women exercise at the swimming pool at the Gellert hotel and SPA. Budapest is known as the SPA Capital of the world. Nearly 120 hot springs feed the city's historic thermal baths (Furdo) and approximately 70 million litres of water used every day. March , 2012, Budapest, Hungary - German tourist enjoys the spa and baths at the Gellert hotel and SPA. Budapest is known as the SPA Capital of the world. Nearly 120 hot springs feed the city's historic thermal baths (Furdo) and approximately 70 million litres of water used every day. March , 2012, Budapest, Hungary - Sauna at the Gellert hotel and SPA. Budapest is known as the SPA Capital of the world. Nearly 120 hot springs feed the city's historic thermal baths (Furdo) and approximately 70 million litres of water used every day. March , 2012, Budapest, Hungary - Sauna at one of the public baths in Budapest. Budapest is known as the SPA Capital of the world. Nearly 120 hot springs feed the city's historic thermal baths (Furdo) and approximately 70 million litres of water used every day. 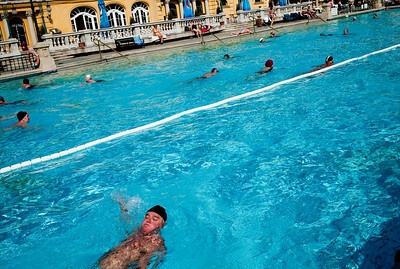 March , 2012, Budapest, Hungary - Locals spend their afternoon, seen at Szechenyi Bath. Budapest is known as the SPA Capital of the world. Nearly 120 hot springs feed the city's historic thermal baths (Furdo) and approximately 70 million litres of water used every day. The water full of minerals is supposed to cure many illness. March , 2012, Budapest, Hungary - Regulars soak in the steam at Kiraly Bath. Budapest is known as the SPA Capital of the world. Nearly 120 hot springs feed the city's historic thermal baths (Furdo) and approximately 70 million litres of water used every day. March , 2012, Budapest, Hungary - Tourists and locals rub honey during a special day of sauna with the essential oils at Gellert Bath. Budapest is known as the SPA Capital of the world. Nearly 120 hot springs feed the city's historic thermal baths (Furdo) and approximately 70 million litres of water used every day. March , 2012, Budapest, Hungary - Tourists and locals enjoy the sauna at Szechenyi Bath. Budapest is known as the SPA Capital of the world. Nearly 120 hot springs feed the city's historic thermal baths (Furdo) and approximately 70 million litres of water used every day. March , 2012, Budapest, Hungary - A German tourist and his girlfriend enjoy the hot bath at Gellert Bath and SPA. Budapest is known as the SPA Capital of the world. Nearly 120 hot springs feed the city's historic thermal baths (Furdo) and approximately 70 million litres of water used every day. March , 2012, Budapest, Hungary - Hot bath at Gellert Bath and SPA. Budapest is known as the SPA Capital of the world. Nearly 120 hot springs feed the city's historic thermal baths (Furdo) and approximately 70 million litres of water used every day. 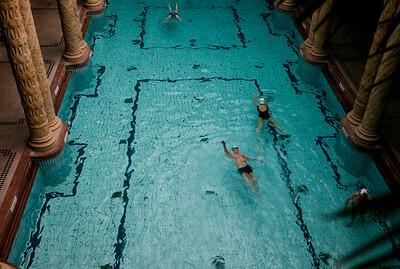 March , 2012, Budapest, Hungary - Locals exercise at the pool in Gellert Bath and SPA. Budapest is known as the SPA Capital of the world. Nearly 120 hot springs feed the city's historic thermal baths (Furdo) and approximately 70 million litres of water used every day. March , 2012, Budapest, Hungary - One of the visitors at Szechenyi Bath and Spa. Budapest is known as the SPA Capital of the world. Nearly 120 hot springs feed the city's historic thermal baths (Furdo) and approximately 70 million litres of water used every day.